Sincere condolences to Chris & Tony White on the tragic loss of Dharma & Trek, taken before their time. Farewell beautiful girl, may you be tracking some magnificent paddocks up there with your mother Rasa. 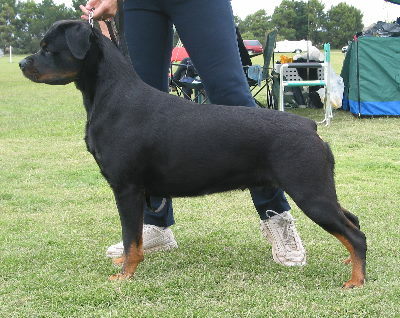 April 2010: Dharma obtains her Tracking Search Dog Excellent (TSDX) title, the first Rottweiler in Australia to do so! Her father Polo obtained his the same day. Go Dharma! Congrats to Chris & Tony. 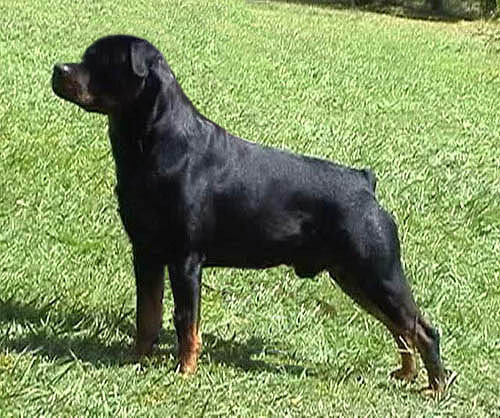 August 2009: At the age of 8 years Dharma obtains her Tracking Search Dog (TSD) title, the first Rottweiler in Australia to do so! Her father Polo obtained his later the same day. Congrats to Chris & Tony. 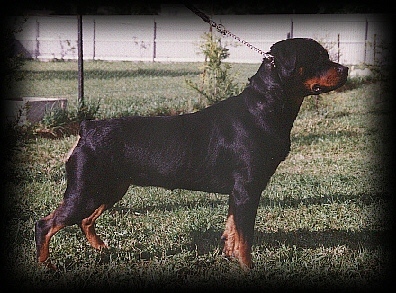 September 2004 : "3 years, complete scissor bite, friendly and alert, middle large, middle strong bones, very nice type, dry strong forehead, middle large ears good set, left ear could be carried somewhat better, good stop, brown eyes, somewhat closely set, good cheeks, could have better fill under eyes, good muzzle, excellent pigmentation of lips and gums, beautiful neck, dry, excellent proportion of chest and forechest, excellent backline and croup, correct angles, very good coat, markings of brown color, should be somewhat darker and richer and better defined all over. Good muscles in rear legs, free movement.